Amber Benson, Max Grodénchik, Jeff Ricketts, Jason Scott, Stefanie Sargnagel, Gerald Votava, Robert Stachel, Stuart Freeman, Katharina Stemberger, Conny Lee, Jolyne Schlien Schürmann, Hannes Duscher, Roland Gratzer, Alexander E. Fennon, Michael J. Epstein, Michael Smulik, Kudra Owens, Martin Auer, David Dempsey, Anna Behne... and many others. I almost met Austrian everything Johannes Grenzfurthner about a year or so ago when his film Traceroute was screening in Indy and Grenzfurthner was popping in for a quick appearance. Alas, my schedule was chaotic that day and our paths ultimately never crossed, an occurrence that likely salvaged any sense of intellectualism that rests within my mostly reactionary, occasionally well informed soul that is constantly called into question every time I see one of Grenzfurthner's works. Grenzfurthner is not a reactionary, though it may take you a moment to realize that given the frenetic, relentless approach the award-winning filmmaker/research/everything approaches his filmmaking. If it sounds like I'm offering up lofty praise for Grenzfurthner, rest assured I'm not grounding this praise in some ego-driven pursuit of Grenzfurthner's but in his almost unfathomably relentless pursuit for informed truth and rejection of ignorance whether he's making a film, acting, writing, directing, researching, coaching or otherwise flying his Lumpennerd flag high. Grenzfurthner is one of the most outspoken researchers in the field of sexuality and technology, yes it's a field, and watching a Grenzfurthner film is akin to watching a seizure-inducing strobe light that somehow simultaneously implants a wealth of knowledge, ideas, and the innate desire to use them for the good of all. 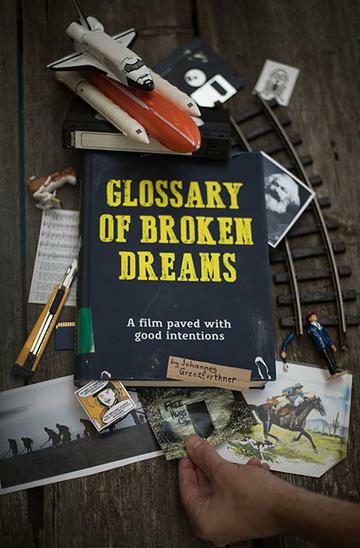 Glossary of Broken Dreams is Grenzfurthner's latest film, though I'll confess I always struggle to call a film a Grenzfurthner film because Grenzfurthner is inherently curious, collaborative and communal even in the ways in which he makes his films. Glossary of Broken Dreams had its festival premiere at Austria's Diagonale and is set for its North American premiere in Burlington, Vermont on April 11th. Yes, Grenzfurthner openly delights in his film's North American premiere being in Bernieland. Described as an "ideotaining cinematic revue about important political concepts," Glossary of Broken Dreams works to combat the cultural onslaught of ignorance that has intensified thanks to the worldwide growth of social media and, as well, that social media's relentless pursuit of monetization. You're likely thinking of Facebook right now, and rightly so, but one of the joys of Grenzfurthner's creatively intellectual pursuit is that it's this kind of pop culture thinking that he rails against. It's more. It goes deeper and Grenzfurthner's Glossary of Broken Dreams challenges us to think deeper while entertaining us along the way. Supported by writer Ishan Raval, Grenzfurthner explains, re-evaluates, and sometimes even sacrifices "political golden calves of discourse," a refreshing, intellectually satisfying free-for-all that rejects false consciousness and topical ignorance when dealing with such subjects as freedom, privacy, identity, "the market," "the Left" and others. Glossary of Broken Dreams explores these topics in ways that are direct, well researched, intelligent, occasionally absurd, frequently enlightening but far from ignorant. The film uses everything from a singing duo, watch the lyrics, to puppets and pixels and anime and live action and stock footage.